Jennifer from Orange City, Florida had a vision in mind when she purchased the Ekena Millwork acanthus ceiling medallion earlier this year. After a couple months wait, Jennifer sent in beautifully minimalistic photos of her completed kitchen project. With this in mind, a minimalist, geometric light fixture accompanied Jennifer’s ceiling medallion. 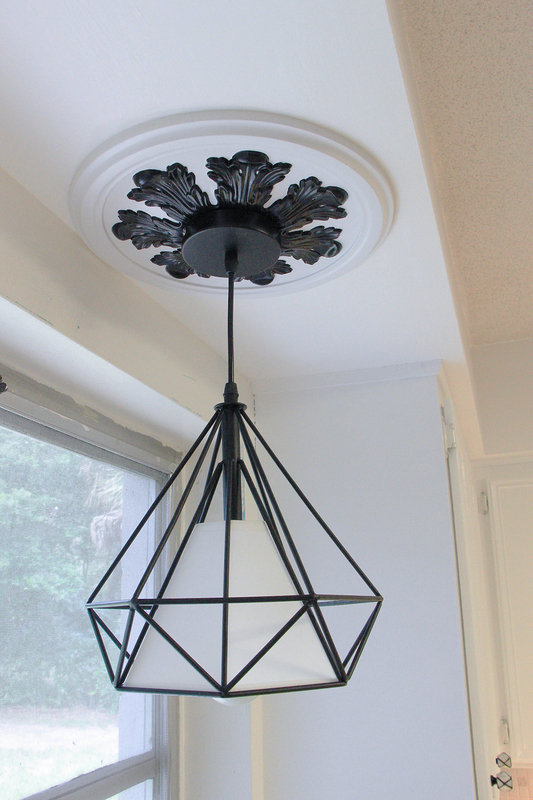 Since the light fixture was black, Jennifer painted part of the ceiling medallion black as well. The black and white contrast between the details of the ceiling medallion makes this specific project simply striking. 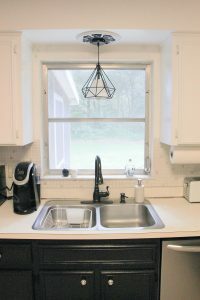 Lastly, Jennifer commented the following: This medallion really added a custom look to my kitchen! I love it! First thing to remember about the ceiling medallion is that it is made of solid urethane. Urethane is durable and lightweight, which makes it perfect for interior home improvement projects. The acanthus ceiling medallion is delivered primed white and can be painted completely or like the one in the picture. Additionally, the ceiling medallions are available in one piece or in two pieces. Overall, these ceiling medallions are durable, easy to install and can be used on the interior or exterior depending on the project. Check out the entire line of ceiling medallions via the link below!